A whistleblower has told House Democrats that during President Donald Trump's inauguration speech, national security adviser Michael Flynn texted a former business associate to say a private nuclear reactor plan Flynn had lobbied for would also have his support in the White House. As the whistleblower chatted with Flynn's associate at an Inauguration Day celebration on Jan. 20, Flynn sent text messages saying the associate's nuclear proposal was "good to go," the whistleblower said. According to the whistleblower, Flynn also informed the associate that his business partners could move forward with their project, which aimed to construct a network of nuclear reactors across the Mideast with support from Russian and other international interests. While Flynn's agreement last week to plead guilty and cooperate with special counsel Robert Mueller's investigation largely insulates the retired lieutenant general from further legal jeopardy, the whistleblower's allegations raise new concerns about the extent to which Flynn may have blurred his private and public interests during his brief stint inside the White House. Trump fired Flynn in February, saying he had misled Vice President Mike Pence and others about his contacts with Russia's ambassador to the U.S.
Maryland Rep. Elijah Cummings, the ranking Democrat on the House Committee on Oversight and Government Reform, said Wednesday that the whistleblower's allegations raise concerns that Flynn improperly aided the nuclear project after joining the White House as one of Trump's top national security officials. The project has yet to get off the ground. Demonstrators at the scene of the Washington, D.C. courtroom where Michael Flynn pleaded guilty to lying to the FBI chanted "lock him up," as he left the area. 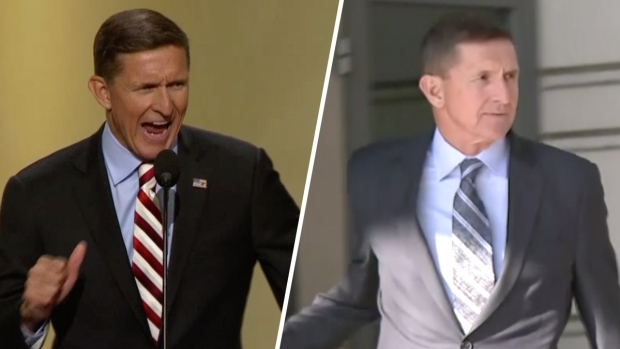 They were invoking a 2016 speech Flynn gave at the Republican National Convention, where he chanted "lock her up" in regards to Hillary Clinton's email controversy. Cummings detailed the whistleblower's allegations in a letter to House Oversight chairman Trey Gowdy, R-South Carolina, and urged Gowdy to authorize subpoenas to Flynn and his business associates to learn more about his efforts to aid the proposal. Gowdy did not immediately respond to Associated Press requests for comment but previously has referred letters from House Democrats about Flynn to Mueller's inquiry. Flynn had been a paid consultant for the venture before he joined the Trump campaign last year. The plan, backed by a group of investors, nuclear power adherents and former U.S. military officers, was to construct dozens of nuclear reactors across the Mideast working with Russian and other international private interests. House Democrats noted that a federal ethics law requires White House officials to refrain for a year from dealing with any outside interests they had previously worked with on private business matters. "Our committee has credible allegations that President Trump's national security adviser sought to manipulate the course of international nuclear policy for the financial gain of his former business partners," Cummings said. The whistleblower told House Democrats that while Trump spoke in January, Flynn texted from his seat on the Capitol steps to Alex Copson, the managing director of ACU Strategic Partners and the nuclear project's main promoter. The whistleblower, whose identity was not revealed in Cummings' letter, said during a conversation, Copson described his messages with Flynn and briefly flashed one of the texts, which appeared to have been sent 10 minutes after Trump began speaking. "Mike has been putting everything in place for us," Copson said, according to the whistleblower. Copson added that "this is going to make a lot of very wealthy people." The whistleblower also said that Copson intimated that U.S. financial sanctions hobbling the nuclear project were going to be "ripped up." 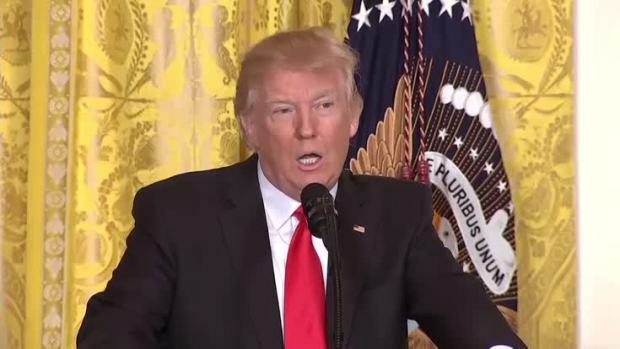 President Donald Trump said he believed Michael Flynn "was just doing his job" as a then-incoming national security advisor to the White House when he called a Russian minister. Trump maintained that Flynn was fired for misleading Vice President Mike Pence. Attorneys for Flynn and Copson did not immediately return email and phone requests for comment. In Flynn's agreement last week to plead guilty to one count of making false statements, prosecutors said that Flynn lied to FBI agents about his discussions on sanctions against Russia with Russian ambassador Sergey Kislyak during the presidential transition. Copson had promoted a succession of nuclear projects designed to include Russian participation dating back to the 1990s. In an earlier note to the committee, Copson said his firm had provided Flynn with a $25,000 check — left uncashed — and paid for Flynn's June 2015 trip to the Mideast as a security consultant for the project. Flynn's financial disclosure did not cite those payments, but he did report that until December 2016, he worked as an adviser to two other companies that partnered with Copson's firm. That consortium, X-Co Dynamics Inc. and Iron Bridge Group, initially worked with ACU but later pushed a separate nuclear proposal for the Mideast.